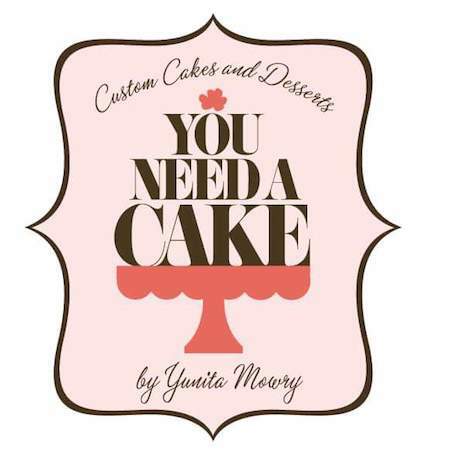 When Yunita Mowry with You Need A Cake first reached out to us to design her booth for the okBride show we couldn’t wait to sit down and eat delicious cake… errr collaborate with her. Small in stature but mighty in spirit and personality, we instantly adored Yunita, and after gobbling down some sweets (with a salad of course) we started on our task. Yunita shared with us the photos from her previous booth last and explained how she wanted to spice it up drastically. 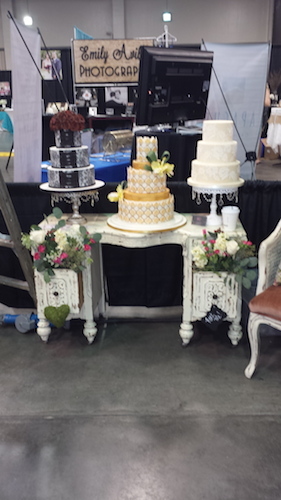 Rather than the typical and let’s be honest, boring 6 foot tables for her to stand behind with cakes on top, she wanted to create a booth that had the atmosphere and feeling of a cake boutique. 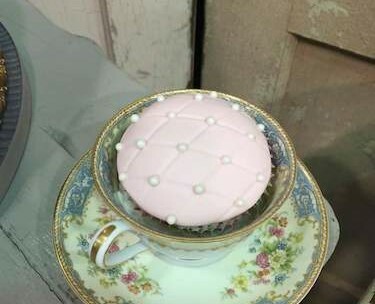 With sample pictures in hand and photos of last year’s booth, we set out to create something that would knock her chef’s hat off and ply us with baked goods for months to come. 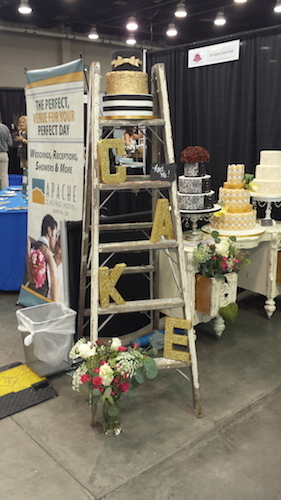 Creating a cake boutique in a 10X10 space is not an easy task. 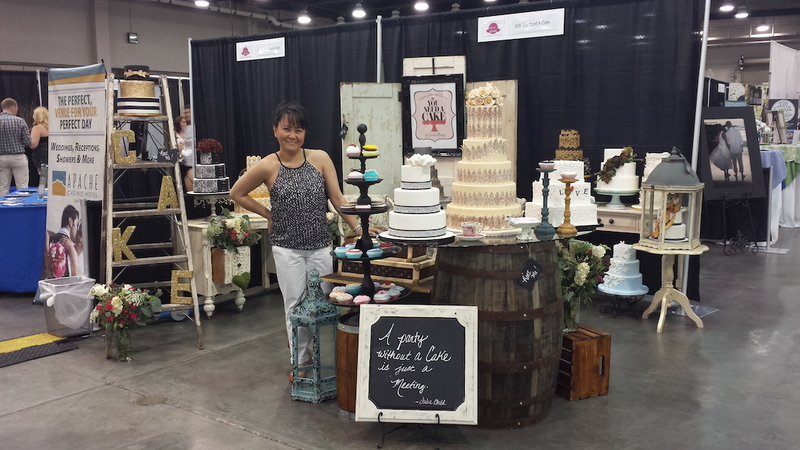 Our goal was to create a booth that would allow Yunita to both display her beautiful creations and also engage with potential brides. 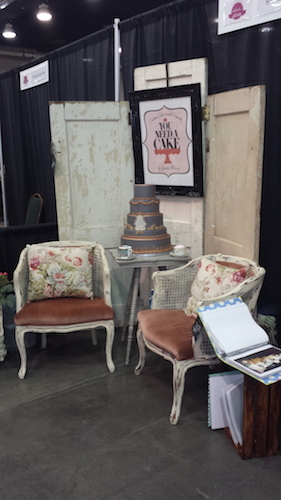 We didn’t want brides to just come into her booth, we wanted them to come through her booth, to get a little lost like Alice in Wonderland, to sit down and have a chat. 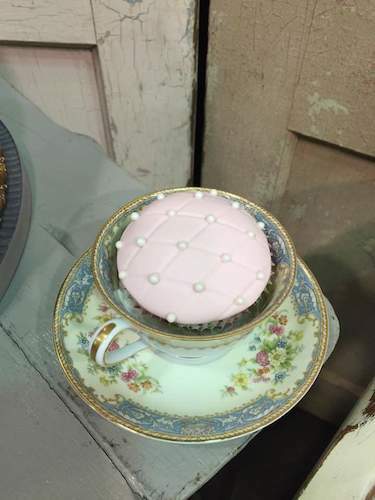 We opted to use our beautiful, dainty and feminine vanities as display tables for multiple cakes with which to frame in a seating area for consultations with Yunita, among touches of cupcake-filled teacups, fanciful caged sugar butterflies and beautiful flowers. 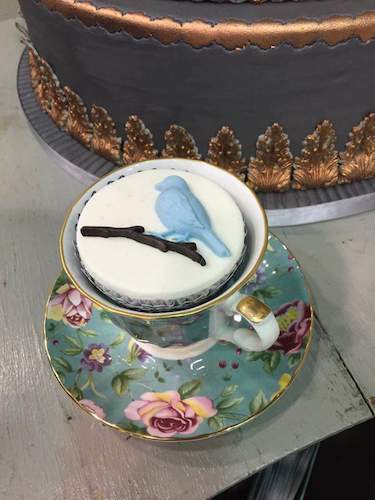 You Need A Cake’s talent doesn’t stop at fancy and feminine. 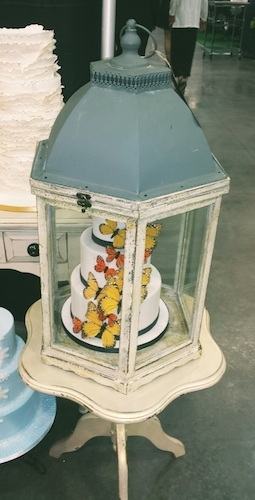 With the ever popular themed rustic weddings, we opted to create a vignette that would allow her additional rustic details & styles to be featured, without taking away overall beauty of the space. 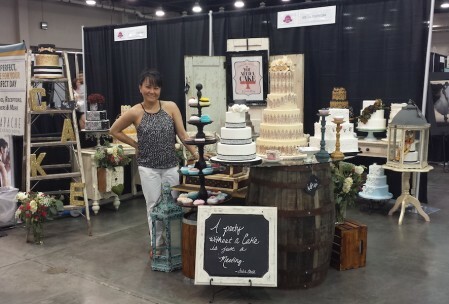 Using an ever popular Whiskey Barrel, we fashioned a corner display that not only created additional table top space, but also the traffic flow through the cake boutique that Yunita wanted. 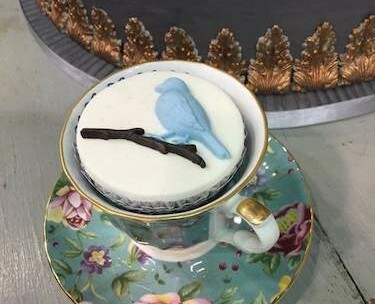 If you are looking for a beautiful and delicious cake for your wedding, party, or shower check we highly recommend Yunita at You Need A Cake. Your eyes & stomach will thank you!